Rep. Gabrielle LeDoux, R-Anchorage, grabbed a 113-vote lead in Tuesday’s count of absentee, questioned and early votes, making a significant comeback since election-day results put her surprisingly down by three votes. But it’s not been without significant controversy. As has been well–reported already, the vote tally of House District 15 has been riddled with problems ranging from absentee ballots requested in the name of seven deceased voters, a higher than usual number of undeliverable by-mail absentee ballots and other irregularities. Tuesday’s review of ballots added 219 early, absentee and questioned votes to the race on a margin that heavily favored LeDoux. LeDoux’s vote tally currently stands at 452 votes in the Republican primary to challenger Aaron Weaver’s 339 votes. Weaver finished surprisingly strong on election night considering he hadn’t run a significant campaign. The state’s report on absentee, early and questioned ballots shows there are a total of 299 of such ballots that have been fully accepted and another 69 that were partially accepted. Additional by-mail absentee ballots can be received as late as Friday, so the count can grow but it’s near impossible that it’ll shift the lead. At this point, LeDoux holds a roughly 15 percent lead over Weaver. Still, the race is likely far from a satisfying finish. Of the 219 ballots added to the total on Tuesday, 26 are considered by the state to be “suspect absentee ballots.” All 26 of the suspect absentee ballots cast in last week’s election voted for LeDoux, but her margin is now so wide that those ballots won’t have an impact on the winner. What is unresolved, however, is just what happened with the suspect ballots and the ballots cast in the name of the seven deceased voters. The penalties for voter fraud ranges from a class A misdemeanor for knowingly falsifying voter registration to a class C felony for voting in someone else’s name. 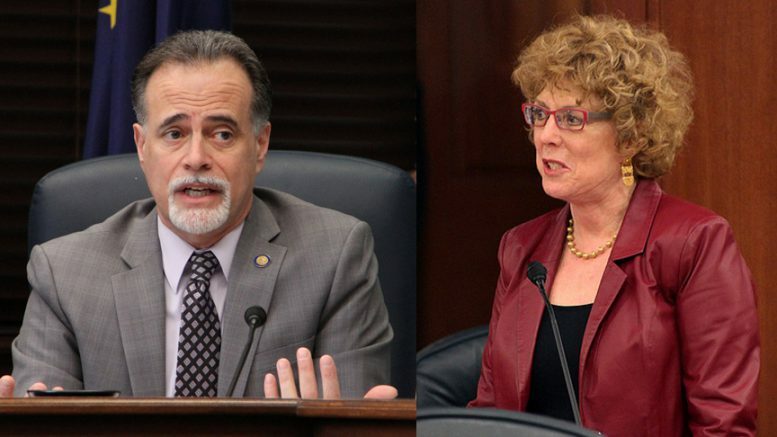 The Alaska Republican Party, which has already disowned LeDoux for caucusing with Democrats and is considering a write-in campaign for Weaver, has been quick to point fingers at LeDoux over the matter. LeDoux has denied any wrongdoing and pointed to her strong results in the absentee voting as a result of an “insurance policy” for tight races. The ADN also highlighted the fact that part of LeDoux’s campaign focused on soliciting votes from the Hmong community in her district, an effort that she spent more than $10,000 on to hire a translator who specializes in voter outreach. Whether or not charges materialized is now in the hands of the Department of Law, and will likely take weeks or even months to be resolved. Not nearly as much fanfare has focused on the other two razor-thin races that are waiting on the full count for a victor. Unlike the race for House District 15, neither of these races has been definitively decided by Tuesday’s count but at least neither has been marked by significant controversy. Sen. Peter Micciche, R-Soldotna, was in trouble on election day but after the first round of counting absentee, early and question ballots should give the incumbent Republican some room to breathe easy. He now leads with 2,930 votes to challenger Ron Gillham’s 2,858 votes. The state reports that it’s received an fully accepted 782 absentee ballots in the district (a number that can grow through Friday), 518 early voting ballots and 74 questioned ballots. So far, it’s counted a portion of that, leaving 165 absentee ballots and 110 early ballots to be tallied. So far, Micciche has prevailed in absentee ballot counts so if the trends hold for the remaining ballots then we don’t expect his lead to shrink. The Republican primary for House District 29, the seat held by Rep. Mike Chenault, is down to a margin of 13 votes as of Tuesday’s tally. Currently, Ben Carpenter is up with 1,367 votes to Wayne Ogle’s 1,354. The state reports it’s received and fully accepted 431 absentee ballots, 237 early votes and 27 questioned ballots in this district. It’s so far counted a portion of that leaving, 130 absentee ballots (a number that could grow through Friday), 65 early vote ballots and up to nine question ballots to be reviewed, leaving the narrow race still in limbo. The latest vote – Aug. 28 5:30 p.m.
Be the first to comment on "LeDoux pulls win out of troubled vote tally while Micciche, Carpenter quietly grab leads"